If a character falls in battle, the items in their inventory will be added to the storage during the next chapter. This still occurs if the storage is full, but it seems less important items are overwritten to make space. 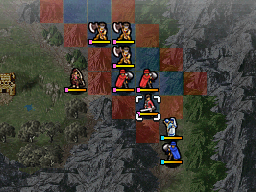 Palla, Catria and Est can perform this special attack by surrounding an enemy from three sides and attacking. The three can be of any class, but the Triangle Attack only works if the initiator is attacking the enemy from melee range (i.e Range of 1). The Silver Card allows its user to buy items for half price (excludes Battle Preparations and the Online shop). It is found in a chest in Chapter 14. The VIP Card allows its user access to Secret Shops (their locations can be found here), which sell rare items such as stat-boosting items. It is dropped by an enemy Bishop in Chapter 17. This spell is required to damage Gharnef, so you can defeat him to obtain the Falchion. It is obtained by visiting the village in Chapter 22, with both the Starsphere and Lightsphere in Marth’s inventory. Both of them are found in Chapter 19, from an enemy thief and from a chest. Master Seals are required to promote characters. During Chapter 24, give the Falchion to Tiki and get her killed by an enemy. You should be able to progress to Chapter 24x upon completion of the chapter. Once you’re in Chapter 24x, check your storage and you should find the Falchion there. Also, at any time after this, just use the Aum staff to resurrect Tiki. Alternatively, you can do the above steps with a different character, but you’ll have to kill off Tiki anyway (unless you didn’t recruit her). Event Recap – Re-read dialogue from the game, split into 193 unlockable events. Sound Room – Listen to all the songs that play in the game (all are unlocked by default). When the Reclass limit for a class has been reached, it’s possible to have one more character be added to that class. Beforehand, you need to kill off a character from the same class. Then, in the following chapter(s), Reclass another character into the same class. Once you’ve obtained the Aum staff in Chapter 24, resurrect the character that you killed off earlier and they will have kept the original class before they died, which means you now have one class over the Reclass limit. Clock abuse refers to manipulating the DS’s internal clock to control stat up gains. In this game, the Random Number Generator, which determines everything from stat up gains to battle outcomes, is tied directly to the DS’s internal clock. By manually adjusting the DS clock to a certain date and time, it is possible to consistently obtain the corresponding sequence of random numbers. Detailed information and techniques for Clock abuse can found in this tutorial by Meteor. Notes: This glitch doesn’t seem to work on the European version. While casting the Warp staff, if the staff animation is quickly skipped, an invisible clone of the teleported character will appear where they were standing before being teleported away. This clone cannot move, but other characters can interact with it as if it were the original character, such as trading items or even using the Warp staff to teleport them again. The original character can also trade with the clone, which is amusing but doesn’t do anything. Nabarl can’t move due to the Julian clone to his right. The clone will remain where it is forever as long as the enemy doesn’t make a move. In the Japanese version, the clone disappears immediately when the enemy makes a move. In the North American version, it will remain for 1 to 3 turns and acts as an effective Light Rune or Shine Barrier from previous games, impeding enemy movement.